I have been training since May for a half Marathon. This Doing The Impossible Challenge came from my friends at Rock This Revival and out of obedience to G-d asking, I accepted. My brother asked me when I began this training, if I enjoyed running, I told him I didn't. I love kickboxing, boot camp, crossfit (I miss it), and lifting weights. I do not love running. And now it's November, I still can't say I love running. I can think of a million things I could do with the time it takes to train for a half-marathon. It is hard on my body...oh my aching knees, feet, and hips!! But, I deeply appreciate running and I am overwhelmed with gratitude for what it has done for me and in me over the last 6 months. When I was a kid one of my favorite activities was listening to my record player. I would listen for hours. I would take in the words and feel the emotion. I would sing, dance, and worship. It was solitude with a sound track...and it was good for my soul. Training to walk/run this half has given me a place of solitude with a sound track and it has been good for my soul. I have listened to music and sermons. I have wrestled through struggles with the Lord. I have prayed and worshiped. Running has given me breath when I felt like life was taking my breath away. It has given me a space to clear my mind, challenge myself, and prove to myself that I can do all things through Christ. It has taken my one word for the year, courage, to a new level. Yesterday's long run was no exception. My running schedule had me doing 10 miles yesterday. 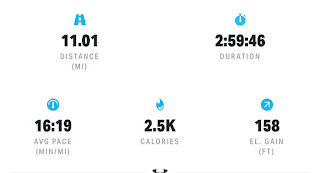 I had thought about not running that distance, but I am glad I did. I have not found myself worked up over distance before, but yesterday I was. I was anxious. Once I got started I got in a groove and allowed the music to speak and just kept putting one foot in front of the other. I was doing well with my 2 minute run/1 minute walk intervals till around mile 9, I am not sure exactly what I did...I just did what I could and I prayed. As I inched closer to 10, it became physically hard....everything hurt. The screaming of my joints and muscles made each step feel impossible, but the voice in my head and in my spirit was screaming louder. It told me I can't. It told me there was no way. Tears began to fall and I found myself sobbing. I kept fighting with myself and for myself. I reminded myself that Jesus would not bring me this far to leave me and that I have come to far. Quitting was not an option, despite my desire to do so. The folks driving down the road gave me some looks. I got myself together and I reached 10 miles. A few more tears were shed and it occurred to me to get home, I could get in one more mile. Just one more. I kept going. 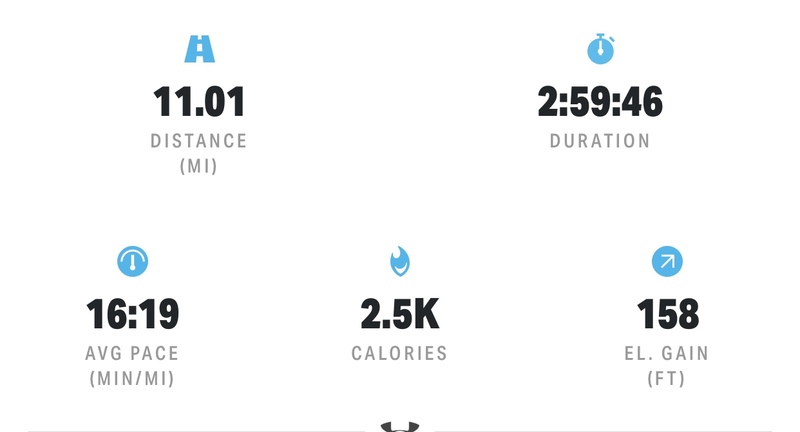 I have no idea what the interval was, but I pushed through. I glanced at my app and realized I could get 11 miles in under 3 hours if I pushed. I did it! I leaned over and sobbed again. This time out of joy, thankfulness, and praise. I was a sight, I am sure. A gentleman pulled over to check on me, asked if I was alright, I said yes sir, they are happy tears. This training parallels our lives and our walks with Christ. We will face hard things. We will need endurance, perseverance. We will need to fight for ourselves and even with ourselves. When given the choice will we do all things through Christ and give just one more mile or will we quit?